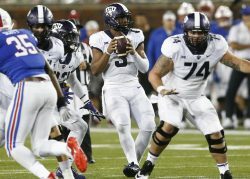 FORT WORTH, Texas — One of TCU’s greatest headaches of 2015 is looking like a serious silver lining for 2016. The injuries that threatened to wreck the Horned Frogs’ defense last season have made that unit far stronger heading into this season. A bad streak of setbacks started right around this time one year ago. Head coach Gary Patterson wouldn’t call those problems a blessing in disguise now that he has the benefit of hindsight, but he does know his team is better today because of them. 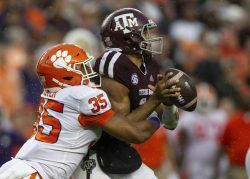 Defensive end James McFarland, the team leader in sacks in 2014, took one unlucky step on a sprinkler head in fall camp last August and had to be shut down for the season. Starting linebacker Sammy Douglas went down with a season-ending knee injury in the opener at Minnesota. The other new starting linebacker, Mike Freeze, quit the team after his first game. And then, before the Frogs even reached October, No. 1 cornerback Ranthony Texada and rising safety Kenny Iloka were lost for the season in non-conference play. Patterson wondered this spring if he had simply pushed his team a little too hard in two-a-days last fall. Then again, he can argue his approach to fall camp was one reason why TCU did survive all those injuries. All those hits forced younger players to step into bigger roles, and those roles could change week-by-week. Nick Orr started eight games at cornerback and five at weak safety. Whether they were ready or not, converted safeties Travin Howard and Montrel Wilson had to figure out how to succeed at linebacker. By the end of the year, only three players — defensive end Josh Carraway, strong safety Denzel Johnson, and free safety Derrick Kindred — started all 13 games at the same position. TCU’s coaches had to ask three or more players to make starts at right end, middle linebacker, strongside linebacker, both cornerback spots and weak safety. In all, 22 players made at least one start for the Frogs’ defense last season. When you encounter that much in-season attrition, you’re probably not supposed to win 11 games. But TCU found a way. And all the unexpected development that occurred, all those young guys thrown into starting jobs and big games, should continue to pay off in 2016. The Frogs get McFarland, Texada, Iloka and Douglas back after medical redshirt years. They brought in junior college transfers Tyree Horton, Markell Simmons, and Mat Boesen to challenge for major roles. They brought in one of the best defensive line classes in the country, a group that got even better with the late addition of ex-Baylor signee Brandon Bowen. Then there are the pleasant surprises, those who have emerged this summer and in fall camp. Patterson has said sophomores Joseph Broadnax and L.J. Collier are pushing hard for the defensive tackle spots, and true freshmanVernon Scott has a chance to help right away at cornerback. Add it all up and it’s easy to see why seniors like McFarland are bullish about this defense’s chances of being a problem for the Big 12. And if those leaders can stay healthy, that would be nice. McFarland knows how good this defense looks on paper. He knows expectations will be high, and that’s a good thing.